When the Analysis and Design phase are complete, it’s time for development. You have the storyboard, a design document, graphics, audio, and video files. Regardless of the eLearning software you are using, Adobe Captivate, Articulate Studio, Storyline, Lectora or others, there are common tasks you can do to make the authoring process more efficient. Take advantage of reusable elements. Most software includes a “library” where you store all the resource for your project. Once you import something onto a slide, it will be stored in the library. 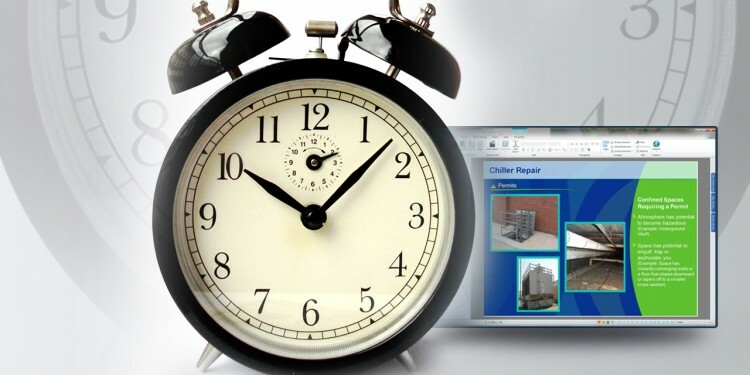 The first timesaver is to add the graphics you will repeatedly need for common items such as navigation arrows, buttons, icons, and any image, sound or video that might appear more than once. When you need those items again, you can get them from the library instead of re-importing them each time. Set up the background of the project. In most software there is a place to set the “slide master” or file properties such as dimensions and background image. To prepare this image, make sure it is the exact dimensions of the project you want to build. Next, remove any element on the background that is likely to change on any slide. You will be setting up one image for ALL slides, so leave off titles and navigation. A typical background image will simply be a graphic look and feel with a logo somewhere that appears in that same place throughout the project. Work with a slide master or template. 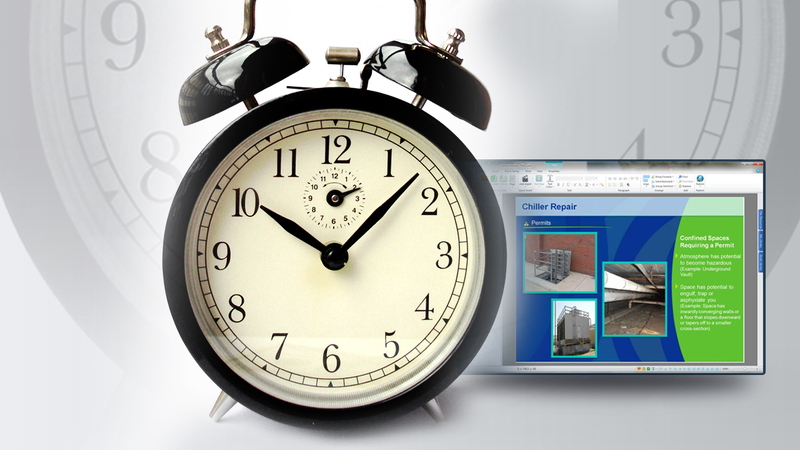 Most software includes a way to create templates or slide masters for a project. Often this includes placeholders for text, titles and page numbers. Think about your project and see if there are repeated types of pages for which you can make template or master slides. Definitely create more than one if there is another look that will be used multiple times in a file. Here is where you can set the font style, color and size so you don’t have to format every text box on every slide. You can also take advantage of built-in tools like page numbering, if desired. In some software you can add navigation once and have it appear on all slides. Then on individual slides you can show or hide any of it as needed. For instance, on the last slide you would not want a “next” button, nor would you want a “previous” button on the first slide. Another example is a slide with a mandatory interaction, so you will want to hide the next button. This eliminates the ability to skip the interaction. You can usually add your own navigation as graphics (such as arrows) that you convert to buttons or use the navigation that is built into the software’s “player”. When you are ready to start filling content in each slide, you’ll probably need to add text that may not be part of your template. When you add a text box, you will probably find that t the default format of the text is all wrong: wrong font, wrong color, and wrong size. Save yourself lots of time by setting up default, reusable styles for your project. Each software does this differently; but it’s worth the effort to learn how. If one slide is similar to another and you have already designed it, duplicate it and then make your changes. When you publish your file, you will be setting up the look and feel of the “player” and also the output that you want. If you are doing a whole course, there will be other files that will need the same settings. Once set up for one file, you can save these publish and player settings for future files. Everyone has their own way of working and you will find what works for you. Hopefully these tips will help minimize the redundancies and save you both time and effort.